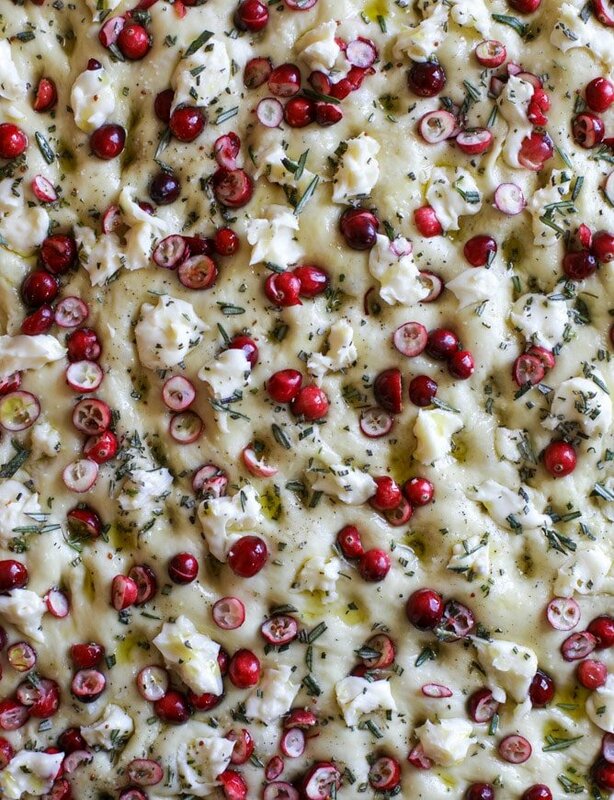 I’m so thankful for the day that I decided to make focaccia bread. Yesssss. I am so serious. 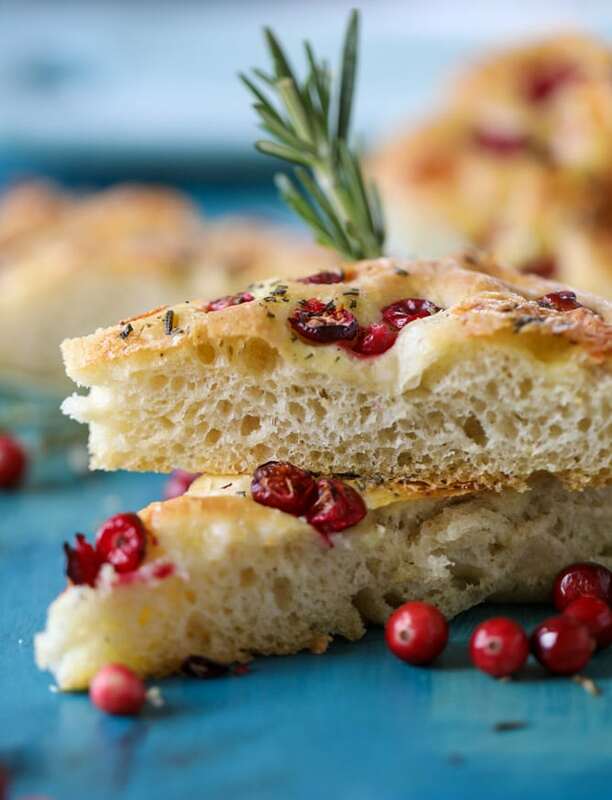 Focaccia bread at home? HELLO. I am in love with it. In fact, as I write this, I have decided that I have to go make this recipe again, right this second. Immediately. Give me a salad and focaccia and that’s all I need for my meal. WEIRD RIGHT. This is the most festive bread! We have fresh cranberries that are slightly sweetened and the creamiest brie cheese that melts into the bread and creates some golden bubbles. Rosemary too, because of the festive-ness of course. Just wait until the next three weeks. I went a little hog wild with the rosemary this year. How can you not in December? It makes all of your food look like Christmas and who doesn’t want to eat Christmas!? The best focaccia bread around me is at DeLallo’s and it’s just… so… soft and olive oil-y and salty. The texture and flavor and overall experience is so incredible that after eating a warm piece this past summer, I was adamant on making some at home. I knew it wasn’t that difficult, and it isn’t. You can totally do it at home, I promise. You need a few hours (but it’s downtime!) so while you’re finishing decorating or cleaning your house like a psycho after a toddler tornado blew through (no idea what that is like), it can rise and bake. My love for THIS exact bread runs deep. First, the flavor combination is awesome. 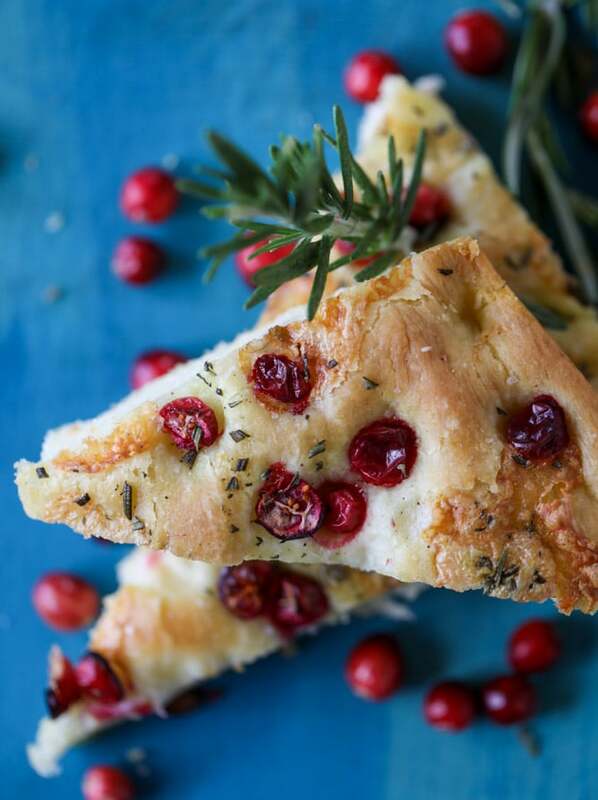 The cranberries are tart, the cheese is melty and creamy, the rosemary is strong and fresh. It looks pretty for the season and if you take it to a party you will be the most popular! AND. 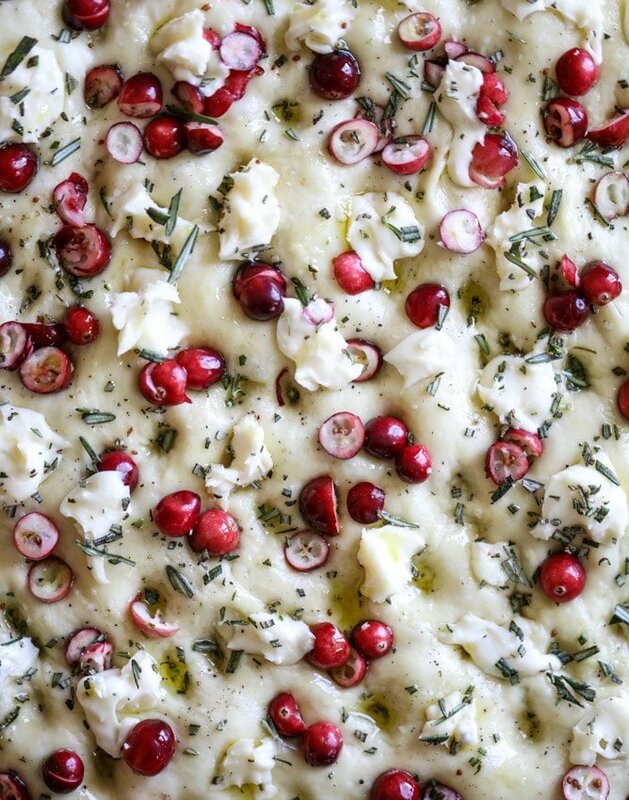 Just FYI – don’t flip your lid at the amount of olive oil that is necessary to make this bread divine. I did a double take too, but TRUST ME it is necessary for that slightly crunchy outside and buttery fluffy inside. Seriously, who doesn’t want a crunchy outside and fluffy inside?! In a bowl, stir together the water, yeast and honey. Let it sit for 10 to 15 minutes until foamy. In the bowl of your stand mixer, add the flour, 1 tablespoon of salt, 1/2 cup of olive oil and the yeast mixture. Stir, using the dough hook, until the mixture comes together. Knead it on medium-low speed for 5 to 6 minutes. If it's super sticky, sprinkle in a bit of extra flour. You want it to be silky! Put the dough in an oiled bowl and cover it. Place it in a warm spot and let it rise for 1 hour, or until it's doubled in size. After it's doubled, place the remaining oil in a 15 1/2 x 10 inch jelly roll sheet pan. Place the dough in the sheet pan and turn it over to cover it in the oil once, then press and spread it until it fits in the pan (or almost fits in the pan. it's going to rise again!). While doing this, press to make finger marks in the dough so it looks like traditional focaccia. Cover the sheet pan and place the dough back in a warm place to rise for another hour. Preheat the oven to 425 degrees F. Place the cranberries, sugar and water in a saucepan and heat over medium heat, stirring until the sugar dissolves. Bring the mixture to a simmer and immediately remove it from the heat. Strain the cranberries from the liquid. 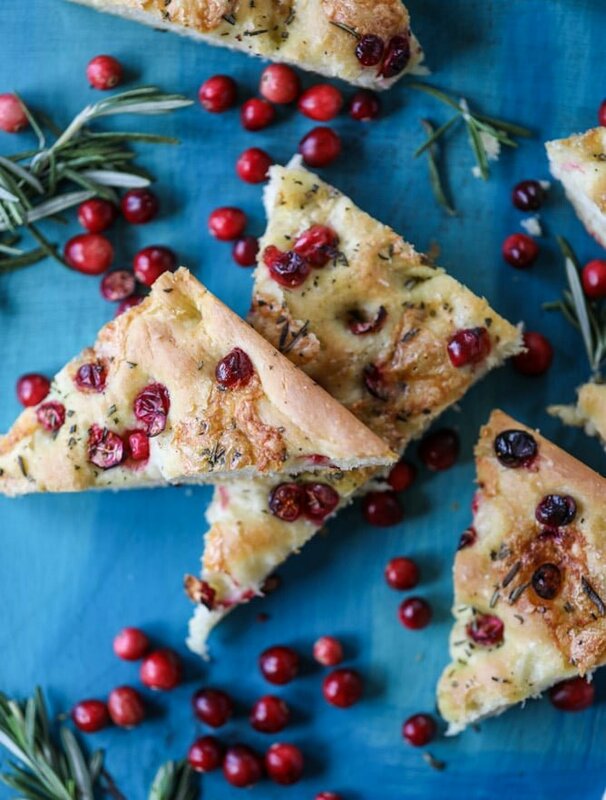 Uncover the pan and cover the bread with the cranberries, brie and rosemary. Add another sprinkle of sea salt and drizzle of olive oil. Bake the bread for 15 to 20 minutes, until it's golden and toasty. Remove from the oven and let it cool before slicing. Devour! Flavor city, I tell you. This bread is so pretty! I love making focaccia at home! Oh my gosh. This looks and sounds phenomenal!! Do you think it would work in a 9×13 pan? thank you! it’s way too much dough for a 9×13 – i would either cut the recipe in half or maybe even in thirds! This look amazing! I will be making this. One of my goals for 2017 was to learn to bake bread and I only made it once….but I NEED to make this!!!! This bread looks so festive and beautiful! Such a good bread to make for the holidays. Love the addition of cranberries! Can’t wait to try this. 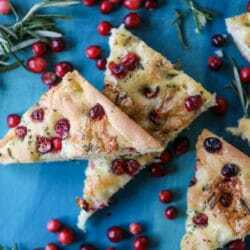 Focaccia bread is one of my favorites and this one looks delicious, not to mention super pretty! This is so festive and I love the flavor combinations! Do you think this would be ok to make the day ahead? Oh my goodness, this is like all my favorite things in one bread! I cannot wait to try this! I have never made focaccia myself before so it’s about time! And I totally agree about the salad + bread combo – I could do it every day all day. 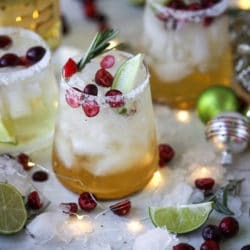 thoughts on how this would work with frozen cranberries? I have some in the freezer I’ve been waiting for a good time to use! it will definitely work! i actually tested it with frozen cranberries the first time because it was September and cranberries weren’t in season yet. :) i would let them thaw slightly, but you’re going to put them in sugar water anyway, so they should be fine! It came out beautiful, but we found the cranberries a bit too tart.. do you have any suggestions? I drizzled mine with honey. I really don’t like the flavor of olive oil. Could I substitute for vegetable oil or butter? Or even just substitute part of the olive oil? Made this for Christmas Eve to go with our seven fishes dinner. It was delicious! I made this to use up some cranberries. I thought this made very good toast the day after I made this. Also this makes a lot. In sum, it was a nice change for a homemade bread.